Kingwood is a master-planned community in northeast Houston. Dubbed “The Livable Forest,” Kingwood is some miles outside of Beltway 8, north of Humble and west of Spring. 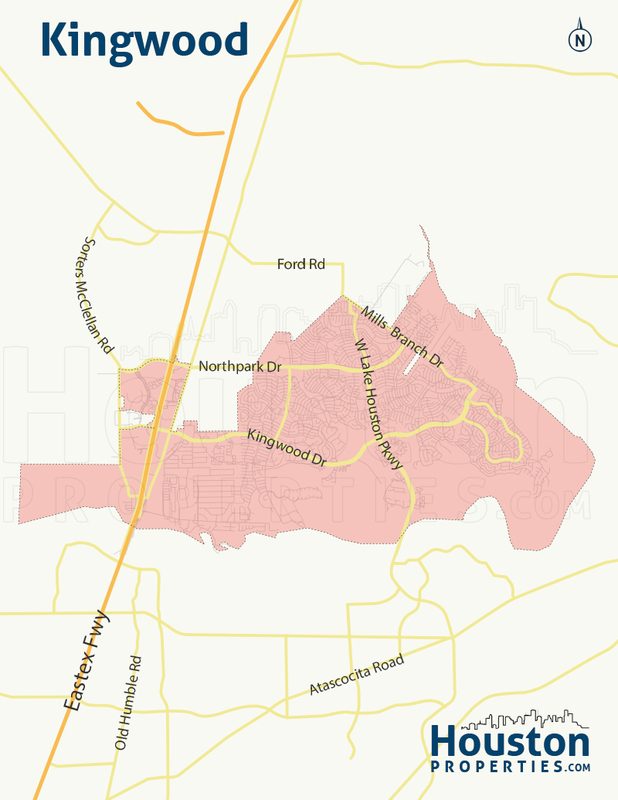 Kingwood was founded in the early 1970s, under a joint venture between the Friendswood Development Company and King Ranch. The community is subdivided into 25 smaller neighborhoods called “Villages”. Located about 28 miles northeast of Downtown Houston, Kingwood homes are centrally located near parks, schools, golf courses, restaurants, cafes, and retail centers. Employment centers in The Woodlands and Houston are also highly accessible from Kingwood homes. Most Kingwood homes are zoned to the Humble ISD, while those located in Montgomery County are zoned to the New Caney ISD. Homes in the area widely vary, ranging from two-story new construction homes to elegant estates. Architectural styles and home sizes vary. A typical Kingwood home can offer 3- to 5-bedroom homes with 2,200 to 9,000 square feet of living space. Lot sizes can range between 7,000 to more than 50,000 square feet. Prices for Kingwood homes for sale are between $300,000 to $2.9M. Kingwood Houston is a 14,000-acre master-planned community in northeast Houston known as the “Livable Forest”. The community is nestled in the area north of Humble, Atascocita, and Lake Houston. 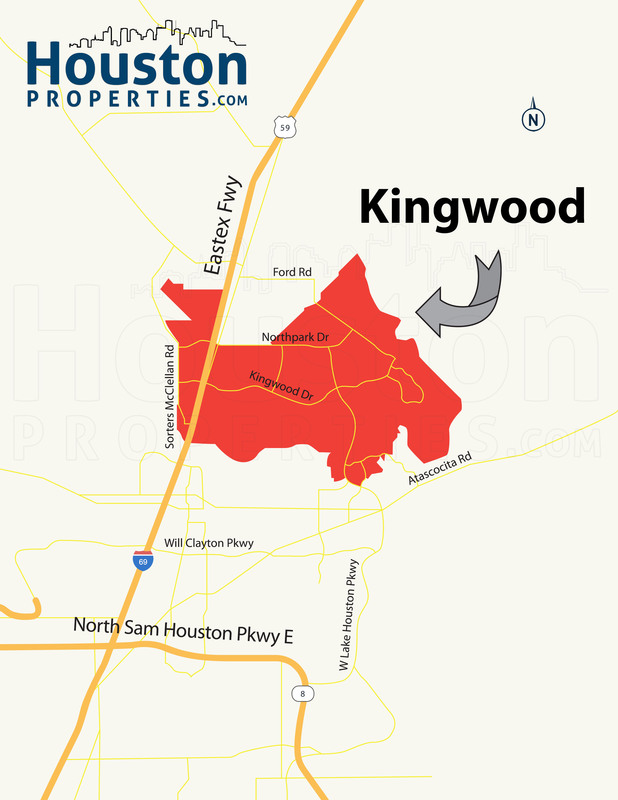 Located about 28 miles northeast of Downtown Houston, Kingwood has easy access to some of the area’s main thoroughfares, including US 59 (Eastex Freeway), FM 1960, and W Lake Houston Parkway. Founded in 1970, Kingwood was developed under a joint venture between King Ranch and the Friendswood Development Company. The community was developed in sections called villages, and today features 25 villages in total. Restaurants, cafes, parks, schools, and retail centers are within minutes of Kingwood homes. Lake Houston Wilderness Park and River Grove Park are among the many green spaces in the area. Two golf clubs, The Clubs of Kingwood and Kingwood Cove Golf Club, are located within the community. Kingwood homes in Harris County are zoned to the Humble ISD, while those in Montgomery County are served by New Caney ISD. A number of highly rated schools serve the community, including Bear Branch Elementary School, Greentree Elementary School, Kingwood Middle School, and Kingwood High School. Homes in the area typically feature 3- to 5-bedroom floor plans with spacious home and lot areas. Home sizes range from 2,200 to more than 8,800 square feet. Kingwood luxury real estate can feature 6 to 7 bedrooms and sprawling 50,000-square foot lot areas. Homes in the community can start at $300,000. The most expensive Kingwood homes can sell for more than $2.5M. Paige and her team of top ranked Kingwood realtors work with a tremendous number of buyers and sellers within Houston.